We all want flat stomachs. But what if the only six-pack in your life is one consisting of beer or soda, not rock-hard muscle? Or what if you're well on your way to fitness, but you just can't get rid of that gut? You don't have to do hundreds of sit-ups each day, and you don't have to give up all your favorite foods. If you devote yourself to the right exercises -- and learn why they're the right exercises -- you'll work your core muscles correctly and begin to build a fabulously fit body. In Core Training Anatomy, health and fitness expert Dr. Abby Ellsworth gives readers the tools they need to embark on a journey of flat-belly fitness and health, from basic movements to information on how to build a complete exercise plan. With step-by-step instructions and easy-to-follow illustrations of starting positions and movement paths, it's like having your very own personal trainer. You'll learn what to do and what not to do in order to get results and avoid injury. 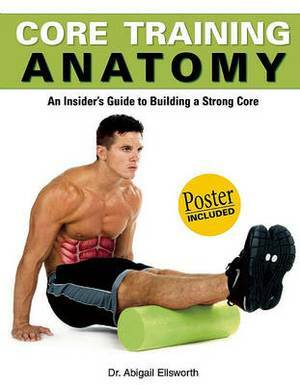 Core Training Anatomy brings a new dimension to workouts, helping readers target this pesky problem area-and helping them stay on the path to health and fitness.